Last week Overwatch got a big update with a new character and a bunch of balance tweaks. The new sniper Ana got a lot of attention, but some of the less obvious tweaks are just as big a deal. Chief among them: A remarkably involved buff to the mech-driving pro gamer D.Va, which has transformed her into the high-flying terror I’ve always wanted her to be. Since Overwatch came out, D.Va has been the character I most wanted to like, despite not actually liking playing her. She has jet-boosters that let her get to high vantage points, guns that never need reloading, a defense matrix shield that blocks incoming fire, and if her mech blows up she gets an “extra life” with a surprisingly deadly blaster pistol. It all sounds great! The problem was, every time I’d charge into combat, I’d get blown up in record time. D.Va’s mech is a humongous target for the other team, and she just didn’t have defensive capabilities to compensate for that and keep them from shredding her. Even just on paper, that is a hell of a lot of tweaks for a single update. In practice, it’s as thorough as it seems—D.Va almost plays like a different character. Her defense matrix shields are now available much more often, which lets a quick player get in and out of hairy situations (or sprint for the nearest medkit) without getting killed. Her jet boost still recharges very quickly, which means she can baaaasically fly; it’s much easier to get out of a sticky situation alive. Her ultimate ability is hugely improved; it detonates faster and doesn’t damage you, meaning it’s possible to get much more aggressive with it. I spent the weekend playing D.Va almost exclusively and I’m hooked. She’s become a highly mobile tank that excels at flanking and ambushing the other team and is infuriatingly difficult to kill. I usually boost my way up to an unexpected vantage, fire down on the other team, back off if they start to return fire, then boost my way to somewhere else. Her guns still don’t do much damage on their own, which I could see being a turnoff for players who prefer sharper-edged characters like Soldier 76 or Reaper. However, with her ability to climb to a high points and fire without reloading, she works really well as cleanup, mopping up opposing players who’ve already taken some damage. Incoming D.Va fire is also distracting as hell, even if it’s coming from across the room and isn’t actually doing that much damage. If the other team manages to take out my mech, I still get that maddening extra life as a hard-to-hit ranged character. And as a bonus, two or three times per match, I’m able to launch a room-clearing nova bomb into the opposing team. As D.Va, I am a terror. I’ve gone a bunch of matches where I’ve died only once or not at all; her survivability has been hugely increased. She plays like a tankier, less immediately deadly version of my top girl Tracer—another highly mobile flanker who can pick off stragglers and drive the enemy team into fits of rage. That’s probably why I’m liking her so much. 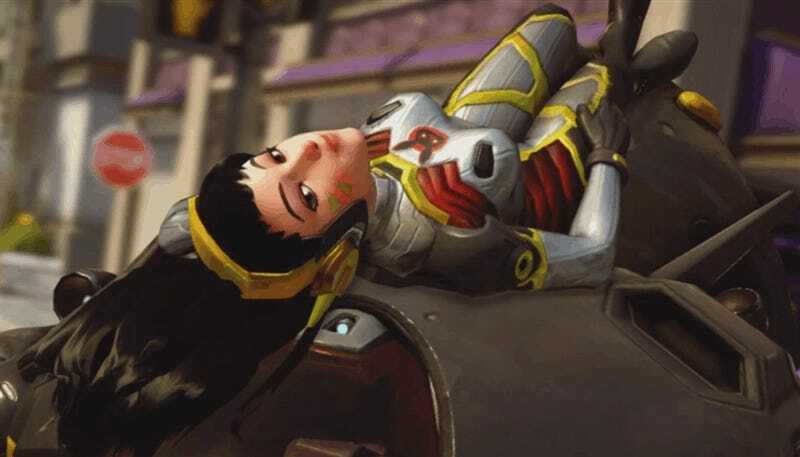 D.Va’s update has further underlined one of the best things about Overwatch: just like when I discovered Tracer, I feel like I’ve gotten a totally new version of the same game. The smartness and depth of the buff also reinforces my confidence that team at Blizzard really knows what they’re doing, not that I really had any doubts on that front. When discussing potential D.Va buffs, my friends and I came up with the obvious ones: Make her guns do more damage, increase her armor, that sort of thing. That Blizzard’s actual buff is so much more elaborate and ultimately effective is a nice reminder that, yes, they made this game, and they know what they’re doing. When other players on my team pick D.Va I’ll hop over to my buddy Tracer for a faster, even more irritating backline harasser. But as long as D.Va’s available, I’ll be in a mighty mech. Whether we’re on attack or defense, escorting or taking control points, D.Va has finally truly become best girl. Until I discover a new favorite character, that is.